When I was younger, I remember being told to live my life to the fullest. I was told time goes by quickly and before you know it you are old and gray. I’m sure many of us heard the same thing from our grandparents and other relatives who were older than us. I am no longer that younger self and I have to attest to the fact that it’s true. 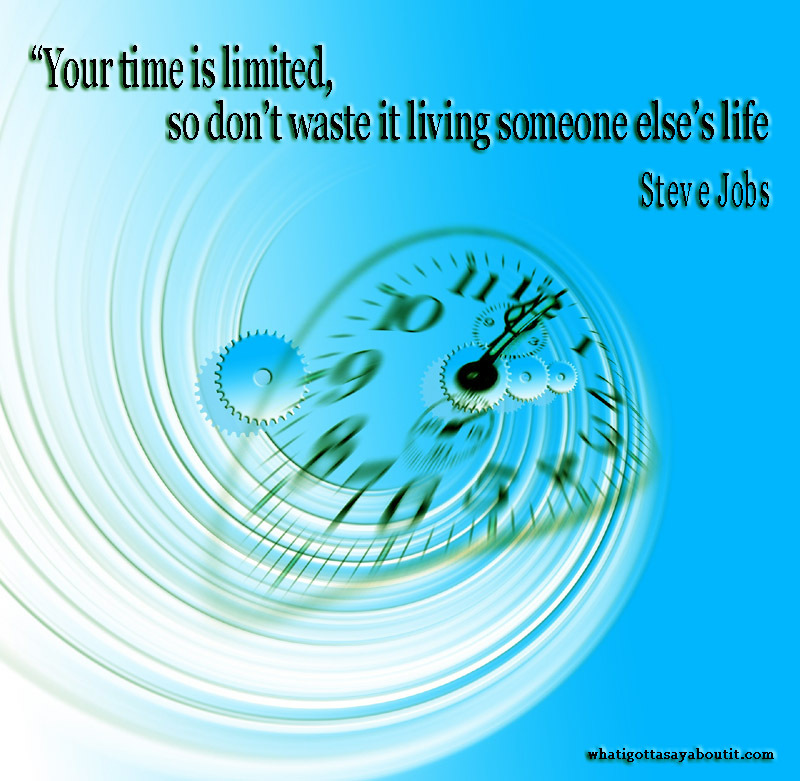 In the quote above, Steve Jobs warns us that our time is limited. He might have been older and it might have seemed that he was passing along the same advice that our grandparents, aunts, and uncles told us when we were growing up. But, I think we all know now that he had cancer and he knew his life was coming to an end. An unexpected terminal illness can wake you up like that. Fortunately, Steve Jobs led a pretty spectacular life and created a legacy for himself. But, there are other people who aren’t so lucky. There are other people who are given the diagnoses of a terminal illness and have to face the fact that their time may be almost over. Please read the Facebook post I found of a young man who will not get to see old age and gray hair. He, like Steve Jobs, learned that time goes by quickly, even quicker for some. We never know how much time we have left Click To Tweet. We all have something to say. Do it now, because time goes by quickly. We may have forgotten what our voice is, but it’s there, waiting for us. It’s up to us to take responsibility for our own life and take the journey of fulfilling our passions. It doesn’t matter how old you are, or what your circumstances may be. You can do it! I leave you with a little video to inspire you. I hope you enjoy it. Let me know, in the comments below, if this impacted you in any way . Couldn’t agree more with what you and those you choose to quote have to say. Life is given to spend, not to hoard. Take risks. The only ones I regret are ones I didn’t take..Good post! Thank you Judy. I love your analogy “Life is given to spend, not to hoard.” That sums it up perfectly. Thanks. It was interesting to view our ONEness from that perspective.